Peter Theunis was able to claim an impressive three first prizes NPO this season, besides several championship titles. And as if that was not enough, his fantastic 2018 season ends with an Olympiad nomination for his Olympic Millennium! Peter Theunis was on top of his game again in 2018, and his most memorable feats are of course his three victories NPO and his Olympiad nomination for the 36th Olympiad, which takes place from 25th to 27th of January in Poznan, Poland. His team was overwhelmingly strong this season, as you can tell from his 11 first prizes in Entente CC Westhoek '70. 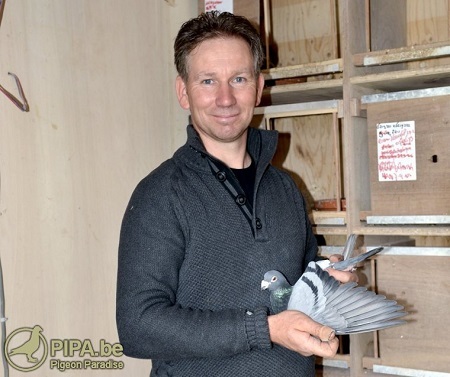 Peter has a top ranking in all the national competitions, and his results in the championships of Province Brabant 2000 are quite remarkable as well. This report takes us back to some of the highlights of 2018, and we also take a closer look at his Olympiad pigeon Olympic Millennium and his three winners NPO. Olympic Millennium stems from the Rocket bloodline, which still plays an important role in Peter's loft, crossed with a son of Maxi (1st National Argenton 3660 p.) of Frans Maris (Itegem, BE). Click here for the full pedigree of Olympic Millennium. At the end of a fantastic season, in which Peter also claimed three first prizes NPO, it was time to take a look at Olympic Millennium's list of achievements so far. NL17-3732555 Super Daisy, 1st NPO Argenton 5187 p.
1st  NPO Argenton       5187 p.
6th  Pont St. Maxence  11447 p.
20th NPO Sens           4971 p.
41st NPO Issoudun       7219 p.
The sire of Super Daisy is NL11-3024491 Super Rossi, the number one breeder for Peter Theunis today. 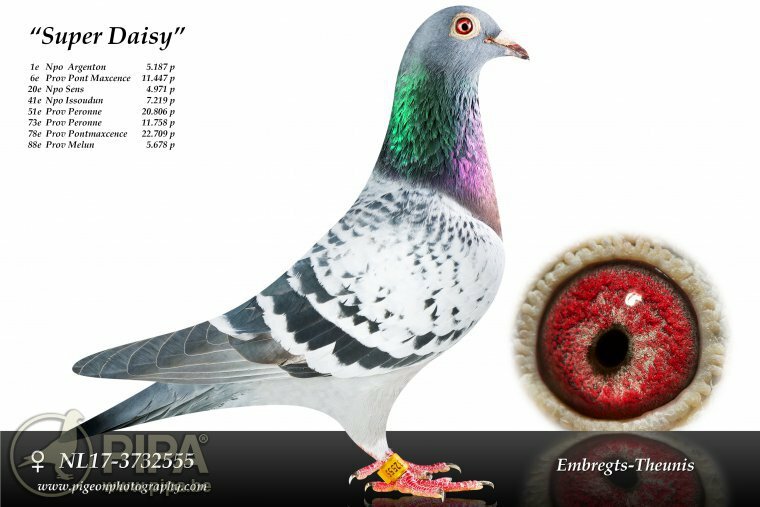 The dam of Super Daisy is NL16-1588028 Argentina, a hen that stems from Argenton (5 x teletext prize) of the successful Scheele Brothers (Terneuzen, NL). Click here for the pedigree of Super Daisy. BE17-6020483 National Rossie, winner of a 1st NPO Gien of 6451 p.
Peter had to wait no longer than a week to get his second first prize in an NPO race. The middle distance race old birds from Gien is also part of the NPO competition, and it is in fact a sectoral race in Sector 1. The fastest pigeon in Province Brabant 2000 and the winner of the first prize NPO was BE17-6020483 National Rossie. There were just two pigeons faster than him in the sector, and so he also claims a 3rd prize in Sector 1 of 23,171 pigeons. This was not the first top result for National Rossie: he had already won an 11th Pont St. Maxence of 11447 p. He was bred by fellow fancier Peter van Oerle, from a daughter of his Super Rossi x grandson BE06-3008003 Rudy of Gaby Vandenabeele. Click here for National Rossie's full pedigree. Lioness, winner of a 1st NPO Gien of 3917 p.
BE18-6021116 Lioness, 1st NPO Gien of 3917 p.
It was thanks to Peter van Oerle, the breeder of BE18-6021116 Lioness, that Peter Theunis was able to claim another victory, in the NPO race from Gien (young birds). 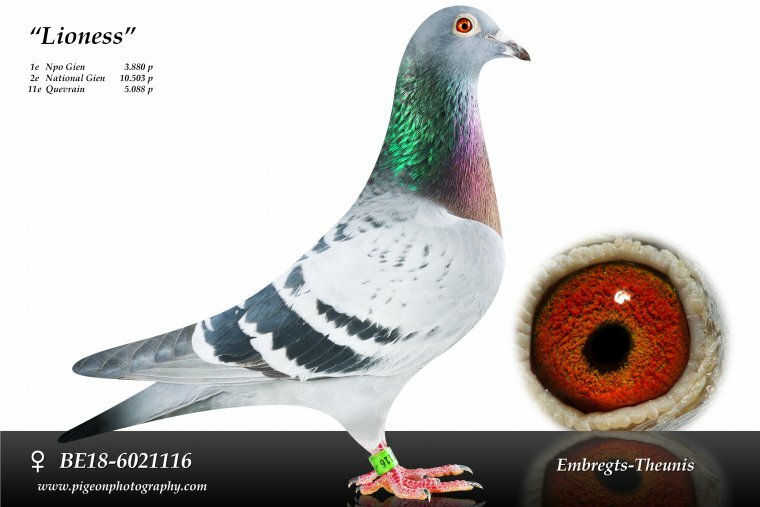 Lioness was 1st of 3917 p. in Brabant 2000, while settling for second national in Sector 1 of 10,503 pigeons. Lioness showed her potential earlier on in Quievrain, with an 11th prize of 5088 pigeons. Lioness is a granddaughter of Blauwe Leeuw, which was 3rd, 10th and 2nd National Ace Pigeon KBDB in 2014, 2015 and 2016 respectively. Click here for the pedigree of Lioness. A conversation with Peter Theunis is usually very straightforward. He likes to get straight to business, as he has a clear take on pigeon racing. Peter races to win, preferrably in races of between 100 and 700km. He puts together his team with this goal in mind: he selects his pigeons at the end of the season, based on their results. This approach has really paid off over the years, and we reckon he will continue to reap the rewards in future seasons as well.